Arlington Heights Firefighters will be hosting a coat drive and participating in the Chicagoland Toys for Tots Toy Drive lasting from November 15-December 15 to help keep the needy warm this winter. Local firefighters and School District 25 are teaming up to help needy student and families in the district. Arlington Heights Firefighters will be collecting new and gently used coats as well as new toys at all four fire stations for the month of November and December. This is the seventh consecutive year the Arlington Heights Firefighters have hosted the coat drive and have collected over 1500 coats as well as countless toys. 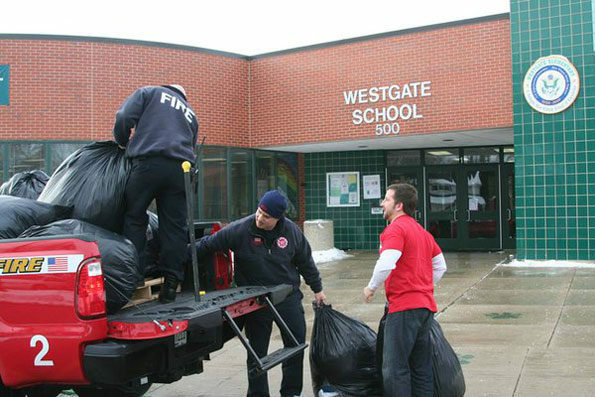 Coat drive delivery by Arlington Heights firefighters to Westgate School from a previous year. Coat drive donation to Arlington Heights Fire Department Fire Station 4 during a previous year’s coat drive.